This is a variation on a cartoon I'm currently working on, with the words and gag part of it removed - it seemed relevant :). There are some tacky bits that won't show in the finished cartoon and the colours have been converted (from print CYMK to RGB), as I had to use Paintshop to resize it to post online. J has often suggested spins on the IF theme that involve sharks, so she should enjoy this one! A position I never want to be in. i love how you did the water. That toe is begging to be bitten! I like the blues in the sea and the motion in it. Eek. I'm gonna have nightmares about being eaten. Great illo. Are you sure this is feet? It looks more like lunch! :) Great job! Lol...great take on the topic..
love the way you've drawn the shark. nice guy. Love the perspective. Great illo. i love the shark's expression! The shark looks absolutely gleeful! Looks like there's some good eating dangling from above! This is a great illo, but it really scares me....what happens next? Wow! 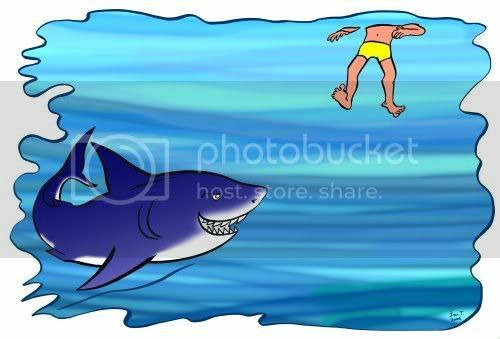 That shark looka happy and i'll bet he's hungry, great job on perspective, love it all. Jaws is back. No water for me. This is great as always. Oooh boy!! Swim little guy swim!! LOL!! Nice illo! Yep, it could be "Feet for Lunch" instead of "Feet for IF" :). It is scary and nightmarish, but sharks are just hungry animals, not monsters, which is sort of what the concept of the cartoon is about (more on that if it gets published). Carla, I have no idea what happens next. Rebecca, your picture Feet by Artipantz is indeed the non-evil twin of mine - they make a great pair! Great cartoon! It works on so many levels. With or without text. It's Jaws with character. i love how you presented the whole picture- The outline looks like it is really and endless sea. i like the face of the shark. great cartoon illustration Ian. this is my favorite illo for "Feet"!! !